In the early days of search engine optimization there was little academic literature on the subject and much of the information that did exist was not substantiated. Matt Cutts shined a light on the world of SEO and focused on how to improve the user experience. Matt Cutts’ name became the herald for our industry. His honesty, openness, and transparency influenced a new generation of search marketers to share, collaborate, and improve the web for all. His expertise and influence helped me learn and with this I am extremely grateful for all that he has given to the search community. When Matt was head of the spam team at Google, I turned in a lot of possible search engine spam. I'd even show how the spam was done...even though I'm sure Matt & his team could figure it out. Well, Matt made me a Google Spam Deputy because I was diligent. He even showed a slide with my name on it at 1 or 2 conferences. Some SEO pros might not like that I continue to be a Spam Deputy. No one likes bad or inaccurate search results...especially when shopping for your Mom's & Dad's birthdays...or for adorable nieces & nephews. Search engine spam can be awful during fragile times, such as the loss of a loved one. Matt's a kind, smart man. I think we are all fortunate to have him as a colleague & friend. A few years back (June 2014) I was chairman of a 17-year old national nonprofit. Google had just released an algorithm (penguin I think) that identified our website as a spammer and effectively shut us off (obviously not literally, but it sure felt that way). We weighed our options (which included having our board go picket Google HQ - admittedly, not all great ideas, but we were desperate). Our web person said "hey, Matt Cutts is speaking at the SMX Advanced conference in Seattle, if anybody could help us, he could". Two days later we're in Seattle hunting for this elusive 'Google Rockstar' guy. Everyone telling me "there's no way you'll ever get to him", "he'll never talk to you", etc. Long story short, he was kind enough to let me introduce myself and when I told him of our plight, he didn't hesitate and said he would have someone look into it - next morning I had a tweet from Matt not only identifying the issues, but providing the solution! A week later we were back up and running! That was one of the best examples of grace and generosity I have ever experienced, Thank you again Matt, you're a class act! Do you remember when the Adwords team rolled out the infamous "Forget SEO, for ranking in Google today, try AdWords" back in 2011? I remember it very well, because - after discovering that ad thanks to a tweet by Ani Lopez - I wrote a raging post on my own website. Albeit I was seriously concerned that Google was allowing an ad so openly against an entire industry of professionals, at the same time, however, I was convinced that my post would have remained just as the classic rant isolated and eventually shared by some other outraged SEO. As I wrote my post late in the night, I went to sleep. The morning after my surprise was huge when, while checking my Twitter, I saw all the tweets sharing and commenting on my post. And my surprise was big when - amongst them - I saw a tweet by Matt asking me to approve a comment he left to my post. What did happen? We may call it: "Time zone jokes"... it was morning in the West Coast when I hit publish, and it happened that my post went viral, so much that Matt felt the need to he felt the need to intervene and to ask those of Adword to change the tone of that announcement. A small gesture, we can think ... and, basically, the whole theme could be considered as the classic "SEO Drama", which many other episodes have had over the years. 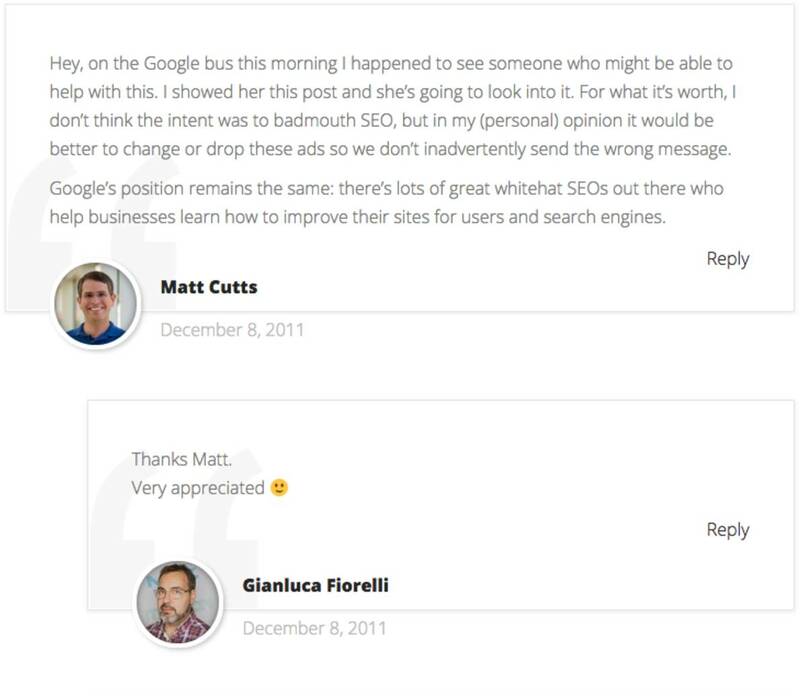 Still, that gesture by Matt Cutts seemed to me the clearest evidence of his real interest in us SEO. Ah! And after that, AdWords never released a similar advertisement again. Matt Cutts is a peach! He really cares about the little guys! I've been a retailer / developer / evangelist for the Yahoo! Store platform since 1997 (before it was Yahoo! Store). 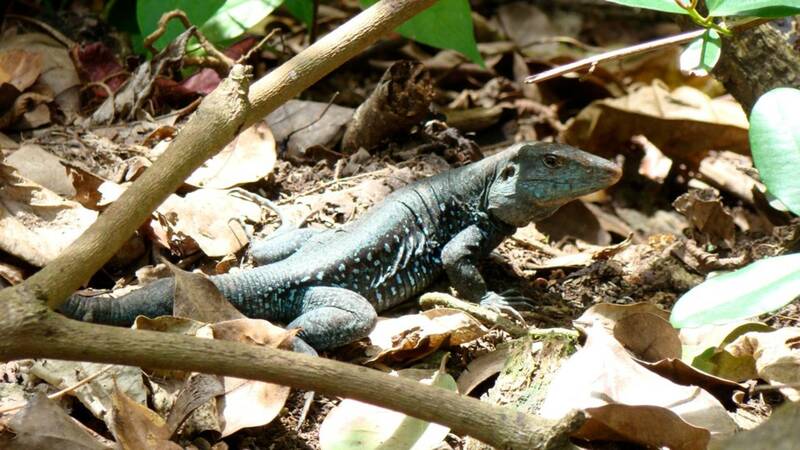 Back in 2011, I was off the grid for a week chasing lizards in the jungles of Dominica. No mobile nor WIFI for a week was heavenly, but when we got back to the airport my phone started blowing up with texts and emails about this new Google update. PANDA! A few retailers on the platform were getting hammered for thin content, and duplicate product content in their shopping feeds, but to add a SERIOUS wrinkle to the problem, there was a SERIOUS problem with (what I think were) platform-wide 301s. The problem showed in Webmaster Tools where EVERY STORE showed overlapping backlinks, and some stores with identical page names would have snippets from other stores showing in the SERPS. The Yahoo! Store PM reached out to me hoping I could call someone at The Google. Fortunately, I kinda knew Matt from a few search shows, so I reached out. Not only did he QUICKLY help diagnose the problem, he hooked my contact at Yahoo! with the Googler in charge of Webmaster tools and they hashed out a solution. Retailers who were freaking out thinking the Yahoo! store.yahoo.net 301 hiccup was causing the results from Panda could sleep easier knowing anything PANDA related was with their content, not the platform. Every other time I reached out on behalf of my retailer peeps, Matt was awesome about responding and helping us find a solution. Many, many thanks to Mr. Matt Cutts! No More Stories But Check Back Daily, A New Story Is Posted Every Day. Back to Top?